Julia was born July 28, 1899 at Grouse Creek, Box Elder County, Utah to Milas Erastus and Annie Elizabeth Kimber Wakefield. Educated at Grouse Creek, but did graduate from Huntington High school, Huntington, Emery, Utah and lived with her Grandfather at that time. Upon returning home she worked in her Father’s store and in the post office where her Father was the postmaster. She was Mother’s right hand after her two older sisters, Leona and Sarah, married and left home. She was active in Church, sang in the choir and she and Dad often sang duets in church. She had a really nice soprano voice. She and Sister Leona learned to play some duets on the piano. She loved flowers. Also she did lovely crocheting and some batting and embroidery work. On the 26th of September 1923 she married Franklin LeRoi Frost in the Salt Lake temple. The winter after marriage they lived in the folk’s house while the family was in Ogden for school and Dad was temporarily working for the Southern Pacific railroad and also living in Ogden. She ran the store and post office. Later they moved into one room of the mother-in-laws (Clara Frost) and there is where their first child Donald was born. A couple or so years later they built a two room house across the road and some distance north of the in-laws. 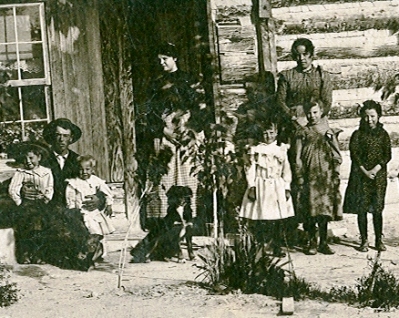 They were still living there when the second son, LaMoyne was born in Ogden. In 1939 the family moved to Brigham City, Utah. Julia worked for J.C. Penny in Brigham for several years. There home was on 333 North 3rd west. In her earlier years she loved to dance and, along with a partner won several prizes for being judged the best dancers at (now of the evening entertainments at the Church cultural hall. Grouse Creek used to have a lot of dances. A basket dance, where ladies were to make a fancy basket and fill it with delicious food for a lunch at intermission.The baskets were put up for auction and the man who bought the basket was the ladies luncheon partner. It was a lot of fun. Another fun time dance was a “weigh in” dance. At the entrance the ladies were weighed and their partner or date paid a penny for each pound of weight as the entrance fee. Mother said that Julia was completely bald until about two years old, but when it did come in it was black and very thick, and she had thick hair until she died, and even then looked nice. At her home in Brigham City Julia had lots of flowers both, inside and out. She had a large patch of peonies and sold many at Memorial Day. Her yard was full of flowers. Julia could defend herself verbally if the need arose but for the most part she was thoughtful and concerned, especially for the family. Anything told her in confidence remained in confidence. LeRoi died in June 1970 and Julia lived alone from then on. Son Donald lived only a couple door away and LaMoyne not too far away. Brigham and three weeks later she passed away at the age of 87. She is buried in the Brigham City cemetery. There are lots of interesting incidents in people’s lives but no where are they written except in the Book of life in Heaven. Julia was a loving and much loved sister/worked hard in her yard and kept her problems to herself. The last few years of her life were filled with many health problems and a lot of pain but she seldom complained.